Dies are placed in sheet metal panels either alone or as a series of presses in a press line. Metal stamping dies and presses can have different input variables on the bases of tonnage, press parallelism, shut height, nitrogen pressure in dies, counterbalance pressure and press speed. These variables can influence the quality of the stamping panel, particularly during die setup. The same stamping press can be reused by replacing one set of dies with another. Metal stamping dies are the devices used in metal stamping machines. Each metal stamping machine can have one or more than one dies depending on the kind of machine. Dies are the main components in metal stamping machines that do the actual casting, punching, cutting and shaping of the metal sheet. 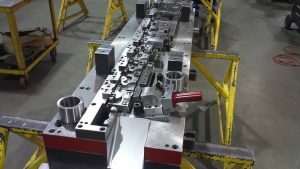 KKtooldie Metal Stamping provides detailed information about precision, custom, and sheet metal stamping, as well as metal stamping machines and metal stamping die.